Half a century ago, the pioneers of chaos theory discovered that the “butterfly effect” makes long-term prediction impossible. Even the smallest perturbation to a complex system (like the weather, the economy or just about anything else) can touch off a concatenation of events that leads to a dramatically divergent future. Unable to pin down the state of these systems precisely enough to predict how they’ll play out, we live under a veil of uncertainty. 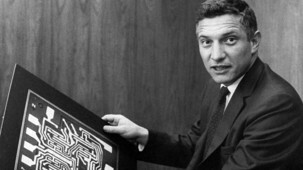 As we contemplate complexity, we might recall that it was on this date in 1961 that Robert Noyce was issued patent number 2981877 for his “semiconductor device-and-lead structure,” the first patent for what would come to be known as the integrated circuit. 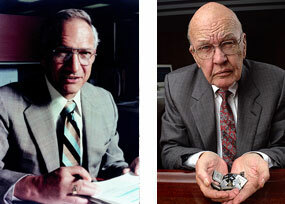 In fact another engineer, Jack Kilby, had separately and essentially simultaneously developed the same technology (Kilby’s design was rooted in germanium; Noyce’s in silicon) and had filed a few months earlier than Noyce… a fact that was recognized in 2000 when Kilby was Awarded the Nobel Prize– in which Noyce, who had died in 1990, did not share. On March 23, 2009 Mike [Leyde, a 56-year old steel contractor from Riverside, California] became the first person on Earth – and quite possibly the first in the universe – to “beat” Bejeweled 2, a game that hundreds of millions of people have enjoyed but never “completed.” Mike achieved the highest score that the game is capable of processing: 2,147,483,647. Yes, you’re reading that correctly – after 2,205 hours and 51 minutes, Mike collected his 4,872, 229th gem and his score totaled more than 2.147 BILLION points! To put Mike’s 2,200-hour-over-three-years investment into perspective: it’s the equivalent of eight hours a day, five days a week for a year. With the advent of the transistor and the work on semi-conductors generally, it now seems possible to envisage electronic equipment in a solid block with no connecting wires. The block may consist of layers of insulating, conducting, rectifying and amplifying materials, the electronic functions being connected directly by cutting out areas of the various layers. 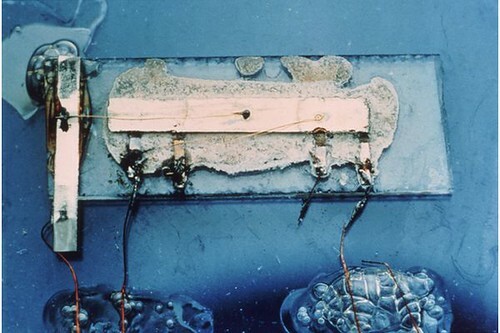 This is now generally agreed to have been the first public description of an integrated circuit– the architectural foundation of PCs, game machines, and essentially all modern electronic devices. The telephone pole, stop sign, the white house and the tree are real and are about a block away from the models. The models themselves are sitting on a table. 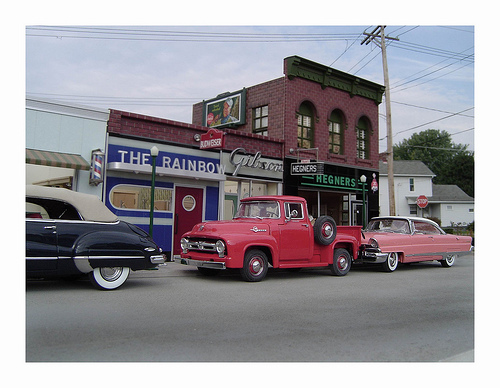 What started out as an exercise in model building and photography, ended up as a dream-like reconstruction of the town I grew up in. It’s not an exact recreation, but it does capture the mood of my memories. And like a dream, many of the buildings show up in different configurations throughout the photos. Or sometimes, the buildings stay put and the backgrounds change. Visually, this is heading towards the realm of ART. NO PHOTOSHOP WAS USED IN THESE PICTURES. IT’S ALL STRAIGHT FROM THE CAMERA. It’s the oldest trick in the special effects book: line up a model with an appropriate background and shoot. The buildings are 1/24th scale [or 1/2 inch equals a foot]. They are constructed of Gator board, styrene plastic, Sintra [a light flexible plastic that can be carved, and painted] plus numerous found objects; such as jewelery pieces, finishing washers and printed material. Spend more time in Michael’s history here. And check out his other sets of model shots— amazing. As we let our fingers do the walking down memory lane, we might recall that it was on this date in 1959 that Jack Kilby of Texas Instruments filed the first patent for an integrated circuit (U.S. Patent 3,138,743). In mid-1958, as a newly employed engineer at Texas Instruments, Kilby didn’t yet have the right to a summer vacation. So he spent the summer working on the problem in circuit design known as the “tyranny of numbers” (how to add more and more components, all soldered to all of the others, to improve performance). He finally came to the conclusion that manufacturing the circuit components en masse in a single piece of semiconductor material could provide a solution. On September 12, he presented his findings to the management: a piece of germanium with an oscilloscope attached. Kilby pressed a switch, and the oscilloscope showed a continuous sine wave– proving that his integrated circuit worked and thus that he had solved the problem. 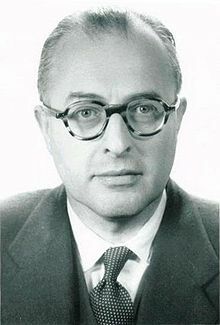 Kilby is generally credited as co-inventor of the integrated circuit, along with Robert Noyce (who independently made a similar circuit a few months later). Kilby has been honored in many ways for his breakthrough, probably most augustly with the 2000 Nobel Prize in Physics.